− Occasionally there may be 12 visible at or above 50 elevation. NOTE: At angles less than 50 the signal has to travel through a greater part of the atmosphere, attenuating the signal too much and increasing the propagation errors. The satellites are solar powered with Nickel Cadmium buffer/backup/peak load batteries to also overcome periods in the shadow of the earth. Electrical and fuel control rockets adjust attitude to remain focused on the centre of the earth, to adjust solar panels to the sun and to maintain orbit. Satellites move with a speed of 14.500 km/hr. The satellites continuously broadcast radio signals modulated with digital data words with orbit, navigation, status and time data, based on up-linked data from the Control Segment. Given the orbit altitude, each satellite ‘illuminates’ approximately 42% of the earth surface. The GPS was commissioned in 1973 as the responsibility of the Joint Program Office (JPO) based in Los Angeles (SVN is Space Vehicle Number). 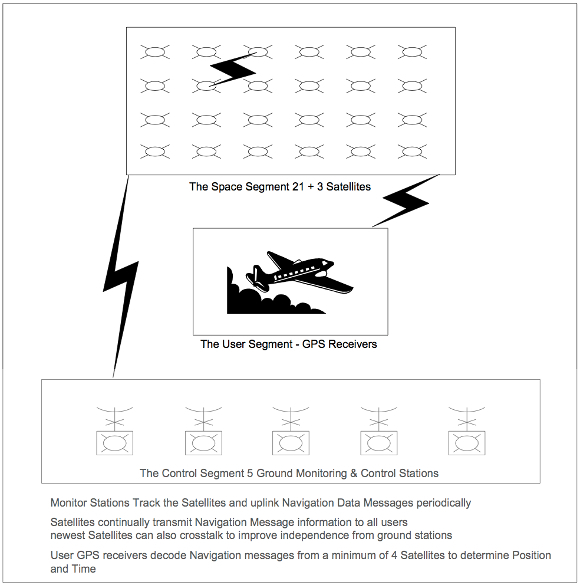 − Block I GPS satellites were concept validation satellites. These are no longer in service although some lasted three times their design life. − Block II satellites were launched as fully operational satellites. These satellites can operate 14 days without contact from the ground control segment. − Block IIA satellites comprise the second series of operational satellites and are designed for autonomous operation of 180 days without contact from the ground control segment. During this period the navigation accuracy will degrade. − Block IIR satellites are operational replenishment satellites. They have the capability to communicate directly between satellites and maintain accuracy during a prolonged period of autonomous operation (AUTONAV). Each carries 3 atomic clocks, 2 rubidium and 1 caesium. − Block IIF, the next generation of 33 satellites will be launched from 2002 – 2012 in three orbital planes with 10 satellites each. Availability will then increase to 0.9993. Block IIF will separate military Lm1 & Lm2 from civil Lc1 & Lc2 frequencies. Ultimately a third civil frequency may be added to support safety of life operations. − SVN’s 20 and 28 failed in space. SVN 42 experienced unsuccessful launch. NOTE: Time is a critical parameter in the GPS system. Atomic clocks are highly accurate (2.10-13 seconds/second or 1 second error in 158 000 years) and expensive (up to US$ 125 000 ea.). Multiple clocks per satellite provide accuracy, reliability and redundancy. NOTE: Each Satellite also carries an X-ray detector payload. Nuclear detonations on earth are detected and triangulated from multiple Satellites to inform the USA where and when nuclear testing takes place. GPS satellites are under surveillance of the Control Segment. Five monitoring ground stations constantly track the satellite’s transmissions, clocks, status and orbits. 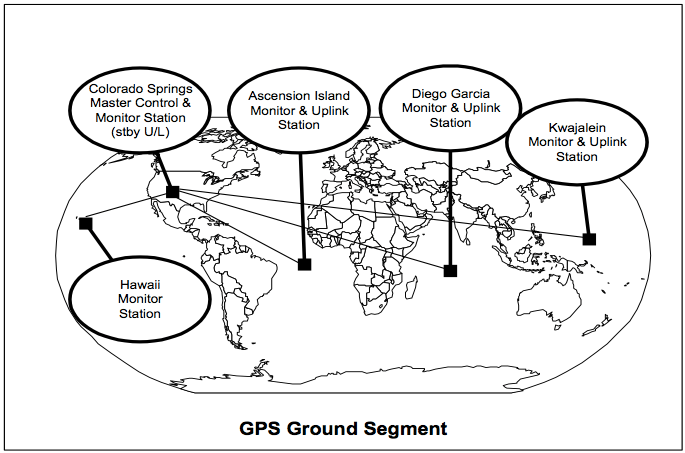 The ground stations are located at Hawaii, Colorado Springs, Ascension Island, Diego Garcia, and Kwajalein. This is the most essential function of the control segment. 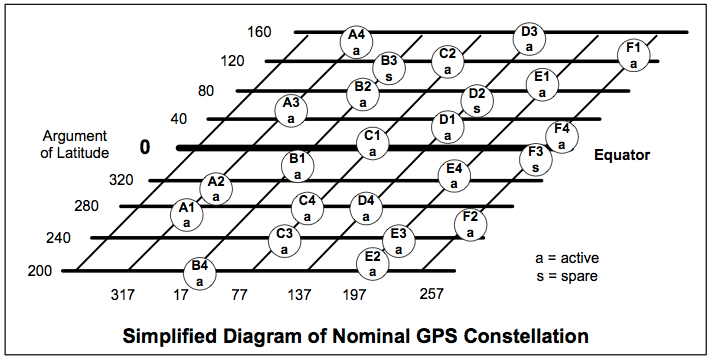 A Composite Clock (a paper clock) consisting of all Monitor Stations and Satellite frequency standards gives GPS time. GPS time in turn is referenced to a Master Clock and steered to UTC from which system time will not deviate more then 1 microsecond. The exact difference is given in the navigation message in the form of two constants for time difference and rate of change against UTC. The system uses Time-Of Arrival (TOA) measurements for the determination of user position. A precisely timed clock is not essential for the user because time is obtained in addition to position by the measurement of TOA of four satellites simultaneously in view. Collected data is send by data link to the Master Control Station, also at Colorado Springs, which calculates the orbital parameters of the satellites. These calculations as well as corrections of satellite time are included in the navigation message. Satellite upload stations provide the satellites daily, via S- band radio uplink, with the latest version of the navigation message. Each satellite then stores the navigation message until the next upload. Faults and failures in the system are detected and corrected by the Control Segment. However, it may take up to 2 hours before a faulty satellite is detected and up to 12 hours to correct the situation. It is this inherent lack of integrity that limits the use of GPS for Aviation purposes. The Time-to-Alarm, in case of satellite trouble, needs augmentations (see also later) to comply with aviation requirements. NOTE: The latest satellites are also provided with an UHF cross talk link allowing the satellites to communicate between them making the system less vulnerable to the availability of the remote ground stations and manage the system from the USA only if needed. NOTE: The satellite atomic clocks require maintenance twice each year, resulting in 18 hours of unusable time for each satellite. Once per year each satellite requires a station-keeping manoeuvre resulting in 12 hours unusable time for each satellite. Resulting in a scheduled constellation availability of 0.98. − Built-in microcomputer or GPS-navigator. The GPS receiver measures the travelling time of the satellites signal to establish its position by triangulation and calculation in Latitude/Longitude/height co-ordinates according the WGS84 (World Geodetic System of 1984) reference system. 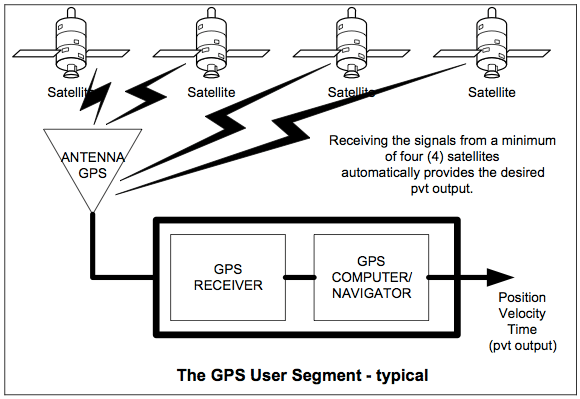 GPS receiver designs differ depending on user requirements and cost. Track the satellites one by one in a slow (1 sec) sequence and need to stop navigating periodically for 30 sec to collect data from the satellite navigation message. Time-To-First-Fix (TTFF) may be up to 4 minutes and the dynamic range is limited to 1g (slow moving or static users). Using the 2nd channel only to collect data from all satellites. range of 10g. (Air users). − Build-in designs, antenna integrated with the, usually handheld, receiver. − Passive antenna, connected to the receiver with a short coaxial cable. − Active antenna, with integral low noise amplifier, connected to the receiver with a long cable.